Our comprehensive advocacy services will save your employees time, money and frustration. With a deep understanding of the entire employee benefits spectrum and all stakeholders involved, our well-educated staff will go to bat for you as an advocate of your employees’ best interest. We’ve developed a track record of success and proven results thanks to a culture of caring and a sense of urgency to resolve issues that you will simply not find elsewhere. As an advocate, we’ll also educate your employees on any issues they may have surrounding their benefits. 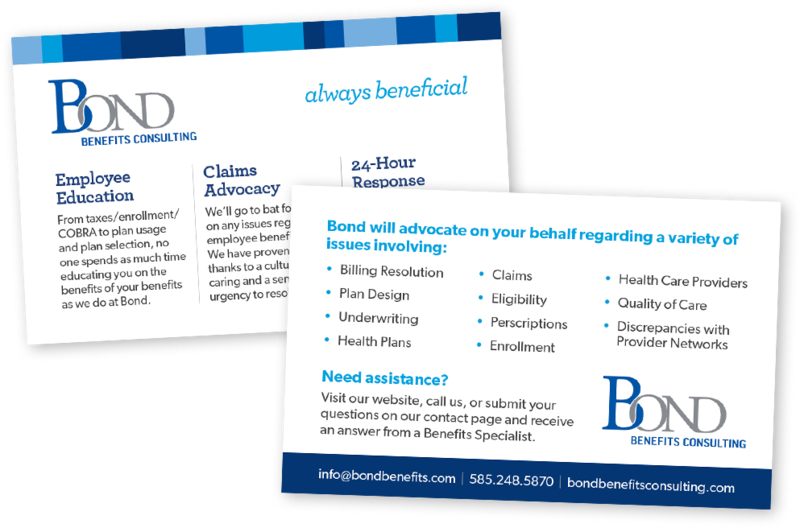 Bond will provide a wallet sized card for each of your employees, with frequently asked questions and contact information to drect any questions they may have regarding their benefits. The average medical insurance customer service issue requires 17 calls and 4.5 hours to resolve? 1 in 5 claims are processed incorrectly? $0.30 of every $1 billed is wasted on misdiagnoses? As the above facts display, issues with claims, billing, healthcare plans, etc. can be very time consuming, confusing and expensive for all parties involved. Whether employees are turning to their HR departments for solutions or tackling these issues themselves, time addressing these issues means time away from the workplace. This valuable time, coupled with employee and employer confusion and frustration, has adverse effects on the productivity of your business. With a highly trained and experienced staff, Bond will advocate on behalf of both employers and employees to avoid these adverse effects, maintaining productivity for your business and ultimately increasing your bottom line. Challenged to administer benefits efficiently and effectively; happered by ability to comply with HIPPA; lack of specialized knowledge; and lack of time. Turns to the employer for help or leaves troubling issues unresolved.